Days of Draw: Mon, Wed, Sat. 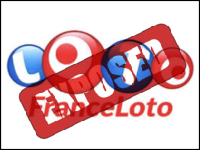 France Loto Exposed — How to Purchase Its Tickets Online? France has a long history of lotteries with the first established in 1754 called the Orphans Lottery (Loterie des Enfants Trouvés). France Loto is not that old, but it has an unbroken tradition of good jackpots with regular payouts. It’s a rollover lottery with pretty good odds. It took a bit of trial and error to get into their French language site, and the language challenge initially daunted me. But after getting out my old school dictionary and using a bit of patience, I was able to dig into what France Loto is. Here’s what I found out. What Makes France Loto Different? France Loto is played 3 times a week (Monday, Wednesday and Saturday). It is a straightforward lottery where players pick 5 numbers from 1 to 49 and 1 lucky number from 1 to 10. There is a guaranteed minimum jackpot of €2.6 million for each draw which grows by €1 million each time it is not won. There are 7 tiers of prizes right down to 2 regular balls or 1 lucky ball can win. Keep in mind, the advertised jackpot all goes to the winner. This isn’t a pool that is divided up into all prize categories like some other lotteries. France Loto Scams: Should You Be Careful? Even the best and the most legitimate opportunities out there could potentially be subjected to scam attempts. Research reveals no France Loto scams at the time being, but this doesn’t mean you should be careful. If you ever receive an email claiming to be from France Loto and telling you that you’d won anything (without even playing), you should know that you’ve become the target of a scam attempt. Who Can Play France Loto and Can You Buy France Loto Tickets Online? To win and technically to play, players must be 16 years or older. Jackpots and other prizes are tax-free and awarded in a lump sum. Depending on where you are playing from, you might have tax implications there. Speaking of players who’re not in France, is it possible to buy France Loto tickets online? Such opportunities do exist, and we’ll take a more detailed look at them in a next section of the guide. France Loto allows for multiple option play (Jeu Multiple) which enables the player to choose 7, 8, 9 or 10 numbers. This generates multiple combinations respectively 7, 28, 84 or 210 entries and does cost an additional amount for each ticket line. France Loto is 72% owned by the French government. It supervises all lottery games and sports betting in France and their overseas departments, including Saint-Pierre-et Miquelon, French Polynesia and the Principality of Monaco. Money from France Loto is used to support sports and sports-related charities, including the research of sports injuries in France through Fondation d’Entreprise La Française des Jeux. In 2005, France contributed €2.3 billion to public finances for sports and social issues. The French cycling team called FDJ is named after their sponsor – Française des Jeux – or France Lotto. It is also interesting to note that in 2009, it paid out €484 million commission to retailers which indirectly stimulates the economy. I did like the one site that talked about the number of multimillionaires France Loto had made since it started – 7,900 players. Ah, but this was under the old original currency system of francs with an exchange rate of €1 equaling FRF 6.5. They did qualify this by saying that more than 150 players had become multimillionaires since 2002 when the Euro officially became the currency. Play France Loto Online: Is It a Legitimate Option? Lottery tickets for France Loto can be purchased through bars, restaurants, corner stores and gas stations in France. It can also be played through online lottery concierge services that charge a variety of different processing fees and/or percentage of winnings. If you are going to play France Lotto online, make sure you chose a lottery concierge that you trust and that includes reading the small print. It would be a real heartbreaker if you won a big jackpot and then either weren’t able to collect your winnings and/or they took a big chunk of it. France Loto’s home site does offer a variety of ways to contact them, including telephone, email and snail mail. There is no live chat which was a bit of a blessing for me as I was already stretching my French language capabilities. I’ll stick to the online lottery concierge services in English to sort out my tickets. Would you mind rating France Loto? This is a straightforward lottery game that is played three days a week with good consist of jackpots. There is a good potential for large rollovers with significant increases in their jackpots. It is government run and controlled so players can be confident in receiving their winnings. France Loto claims the odds of winning their smallest prize are 1 in 16 which might not be a lot of money, but you will be able to say “I’m a Winner.” Looking at some of the jackpots that have been won, they do build fast. How Much Does It Cost to Play France Loto Online? I never received any “france lotto promotion” but the fact is that this lottery is opened for international players as for us players. I find this super bonus! It’s state lottery and very trustful and the best thing there are three draws in a week! So three chance to win! Actually, yes it is. To win something in the lottery, you have to play it. If you didn’t buy the ticket, you can win. Yep, it’s that simple! I am trying to help my uncle who is 88, and lives in California. He just received a letter saying he won $1,660,000 in the “French Lotto Promotion Progams” lottery. He’s under a lot of stress because he doesn’t know whether he should pursue it or ignore it. The letter is postmarked from Portugal. The lottery “financial consultant” he is instructed to contact is Mr. Dennis J. Buckingham at 011 33 753 608 841. The letter is signed by Mrs. Barbara H. Veretout, Vice President. According to the letter, he will lose the funds if he doesn’t claim them by October 1, 2015. Sorry to disappoint you, but it’s a scam notification. Tell your uncle to ignore this letter. You can’t win the lottery if you haven’t bought the ticket.